INTRODUCTION: The benefits of the laparoscopic approach in inguinal hernia surgery are most evident when performed for bilateral cases. A single surgery to address bilateral pathologies would be practical and cost efficient. MATERIALS & METHODS: Our single centre series involves a retrospective review of 74 consecutive patients who underwent endoscopic totally extraperitoneal (TEP) repair for bilateral inguinal hernias from 1999 to 2006. RESULTS: The mean age was 55 years (range 21-86) with males comprising 98.6% of our patients. Laparoscopic repairs were carried out using a flat mesh with an anchoring device in 77% of patients while a multi-fibre polyester anatomic mesh without anchoring was utilized in 23% of cases. On the left, 94.6% of hernias (n=70) were primary while only 4 recurrent. Indirect hernias on the left were identified in 40.5% of patients, direct hernias in 44.6%, and pantaloon hernias comprised 14.9%. On the right, 69 hernias were primary while 5 were recurrent. Indirect hernias were found in 47.3% of patients, direct hernias in 31.1%, and pantaloon hernias in 21.6%. The mean operative time was 88.6 minutes (range: 20-205 min). There were no conversions to open surgery but 2 patients had unilateral recurrences (1 L, 1 R) for a cumulative recurrence rate of 1.45%. Unilateral groin seroma was identified in 5 patients (9.5%) while unilateral hematoma was described in 2 patients (4%). The mean inpatient hospital stay was 1.15 days and 17.6% of cases were performed as outpatient surgery. Mean follow-up time was 26 months with 87.5% patient satisfaction. 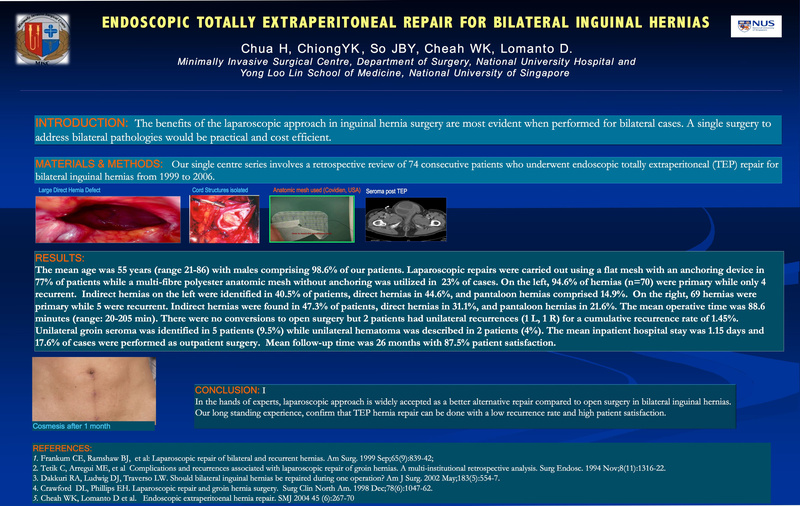 CONCLUSION: In the hands of experts, laparoscopic approach is widely accepted as a better alternative repair compared to open surgery in bilateral inguinal hernias. Our long standing experience, confirm that TEP hernia repair can be done with a low recurrence rate and high patient satisfaction.